Pledges allow users to record who pledged to give what, compare that to what they actually gave, and send statements to donors showing their pledge summary (total given vs. total pledged). When a pledge is created, it is given a date range and what fund(s) it includes. Any contributions (even if previously created) that match the date and fund for that person will be included in what was given to that pledge. All pledges must exist within a campaign. Campaigns help organize pledges into different groups. For instance, you may have a campaign named "2018 Building Campaign" or "2019 Pledge Drive." Navigate to "More > Contributions > Pledge." Select the campaign you'd like to add a pledge to. Click "Add Pledge" in the upper right. Fill in the fields and click "Add Pledge." If adding multiple pledges, select the "Keep Open After Adding" checkbox to avoid having to reopen the add pledge window each time. Settings will also be retained (e.g. fund will stay on the same fund as the previous fund for subsequent entries). Click pencil icon on the right of the pledge you'd like to modify. Fill in the fields and click the "Update Pledge" button to save your changes. Select the campaign you'd like to delete a pledge from. Click the remove icon on the right of the pledge you'd like to delete. Our best practice solution for churches that manage yearly pledges would be to have a separate fund for each pledging year. This will allow givers to easily pre-pay for pledges without it affecting the current year’s pledges in any way. This is possible because pledges look at both the date range and a specified fund in order to know what contributions to count toward a pledge. Sometimes people want to pre-pay their pledge, i.e. make their donation on Dec. 31st for the upcoming year. Typically pledges are for a specific timeframe (i.e. January - December 2018) so when you enter a person's pledge, you enter the start date as 1/1/18 and the end date as 12/31/18. In the case of pre-paid pledges, you will want to enter the start date as the date the person made their prepayment (i.e. 12/31/17). This way the payment that the person made early will count towards their pledge for the following year both in your view of the pledge information in Breeze as well as the individual's giving statement. By default, Breeze will assume that all members of the family are to be considered under one pledge. If multiple members of the family would like to have separate pledges set up, this can be done with just a couple of extra clicks! Fill out all the information on the window that pops up and then click "show more options"
Deselect the button that says "include all family members"
Now the pledge will only be attached to the name included in the pledge, and not the whole family. If you'd like to update your members on the progress of their pledges (including members who have pledged but not yet given), you can do so by creating custom pledge statements right within Breeze. 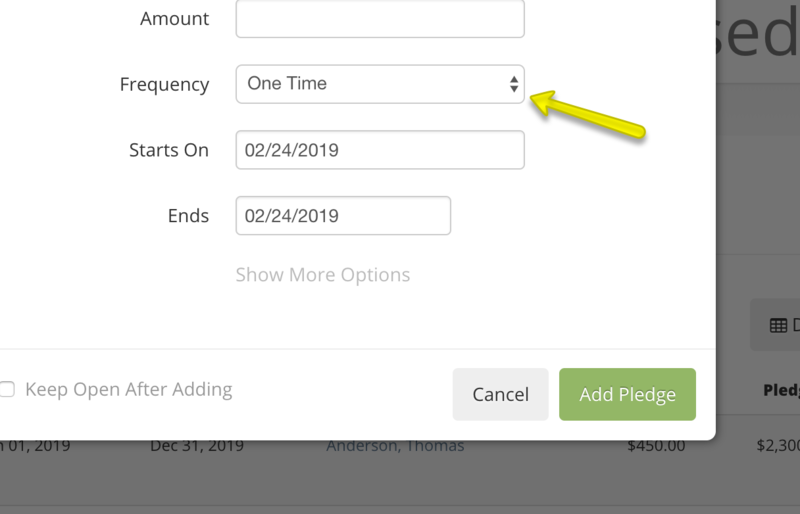 Under the "Pledged To" filter select "Campaign Name"
If you'd like to customize the pledge summary included in your statement you can do so by following the directions outlined in Creating and Customizing Contribution Statements. By default, the pledge summary will contain the 1) campaign name, 2) date range, 3) frequency, 4) amount paid compared to the total amount, 5) amount remaining, and 6) percentage paid. How can I print a pledge statement that has not yet given? When you go to More > Contributions > Reports you can search by pledge. Click on the pledge you're interested in and then select the button directly below that says "include non givers". Now anyone who has pledged, but has not yet given will be included in the report and will have a statement printed/emailed for them as well. Our church just acquired this program and we are starting to figure out the best way to add pledges from a campaign that began fall 2017. I tried to enter the donors individual total pledge amount for $5,000 and I received an error message stating "Please enter valid amount." Am I miss understanding what "pledge" means in this system? We are looking for something that would take all individual pledges and keep a running contribution schedule for them as well as an overall campaign pledge total. Thank you. Yes, removing all characters has removed the warning. I'm still having a challenge with the way the system calculates a pledge based on the "amount" field. It appears the field is set as a payment vs. the total pledge amount. Shouldn't it be the total pledge then the schedule break down what the payments should be over a period of time or number of gifts? We have a three year campaign and often times ask for an initial payment before the schedule begins so we don't know the exact payments. If you are attempting to capture the total pledge amount, I would recommend adjusting the frequency to total amount instead of the different payment schedules listed. When adding contributions, I do not always know if someone had pledged or not. I have a "Pledges" fund that I use to designate whether a person is paying on their pledge or paying for something else. Without getting out of the add contributions mode and going to the pledges page and looking for a particular person, is there a way that I can tell if a person has pledged? Currently we have a "Contributions" fund to track anonymous and non-pledged giving. Great question! This is something I get asked a lot and at this time, there is not a breezy way to see from the "Add Contributions" page if someone has pledged. While this may not be ideal, we always appreciate feedback and are always on the hunt for ideas that can help churches even more than Breeze already does. For more information about submitting a feature request, please check out www.breezechms.com/features. You mentioned "Without getting out of the add contributions mode and going to the pledges page and looking for a particular person, is there a way that I can tell if a person has pledged? One trick I've found very helpful is to open Breeze in a second browser tab. If you're working in Contributions in one tab, you can use the other tab to look up someone's pledge without having to leave and reenter Contributions. Using two open tabs is useful for a lot of similar situations.